Just ordinary guys enjoying the "Magnificient Obsession" of radio-controlled model warship combat. 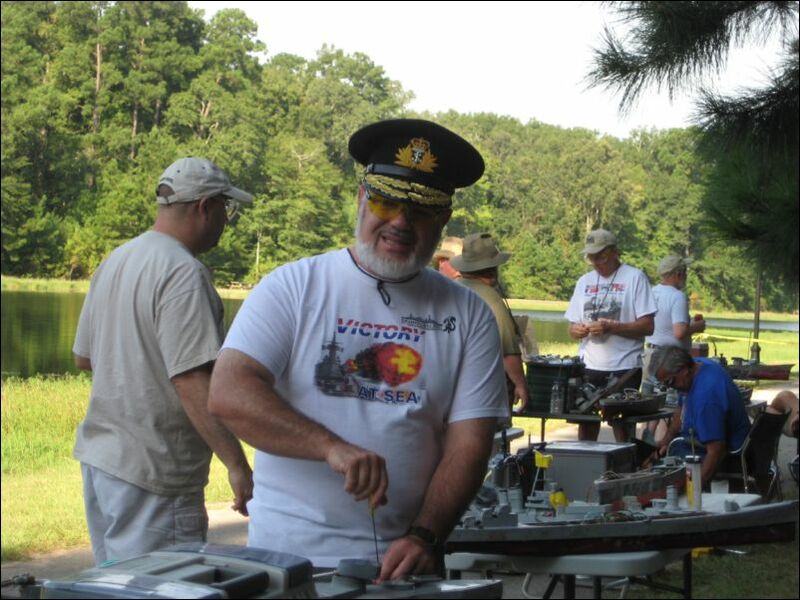 Brian and Pete have been active captains in the hobby of radio-controlled model warship combat since 1999. We have built ships on both the allied and axis side of the hobby and have seen probably more than our fair share of "soggy pants victories" (in this hobby we actually win as long as we all have fun). Like most the captains in the hobby we enjoy building and battling our warships but also enjoy the comradarie of the other people in the hobby. 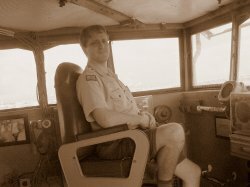 Brian relaxing on the bridge of the USS Yorktown (on a tour with his son's Scout Troop). What lead us to start Grey Wolf Squadron Shipyard was the beautiful craftmanship of parts made by our friend and fellow hobbiest, Peter Kuisch. Peter was an excellent wood-craftsman and had made very detailed plugs of several of the parts we now offer. When health and other issues prevented Peter from continuing to offer the parts many of us had come to rely on, we obtained his originals so that we could continue to make them available to people within the hobby. We hope the quality of our casts and new original parts continue to impress people the way Peter's parts did. Our hobby is where are friends are. We started into this business for the benefit of our fellow friends in the hobby and we continue to enjoy time with them every battle we are able to attend. We make every part as if it will end up on the ship of one of our friends (since many actually do) and if any part is ever unsatisfactory to a fellow captain we will gladly replace it.